We offer a friendly, intimate and relaxing atmosphere. The hostel is ideally located in the centre of Barcelona, within walking distance to all major tourist attractions, museums and the busy nightlife area. The area is surrounded by 3 Metro stations and you can also find many services such as a post office, pharmacy, supermarket and several banks with ATM machines. Also nearby are various types of food available in the neighbourhood’s numerous restaurants and bars. Our multilingual staff will help you providing all the information that you need. 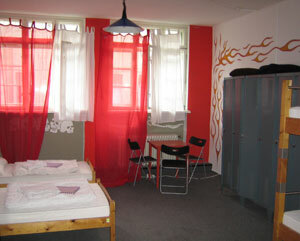 Accommodation is offered in 2, 4 and 6 beds. Most of the rooms have ensuite shower and toilet facilities. We also have private rooms to offer at a very moderate price, with doubles and twins, with or without showers in the room. All rooms have TV. CHECK-IN from 9 AM till midnight. There is NO CURFEW and NO LOCK-OUT so you can stay out as late as you want and sleep in as long as you like. This is a great place for making friends with the opportunity to enjoy all the sights Barcelona has to offer. Right in the Heart of Barcelona OUR 3 HOSTELS, create a genuine triangle, very close to each other and: Les Rambles,Plaza Catalunya, Barrio Gothic & Barceloneta. UNBELIEVABLE BARCELONA AIRPORT CONNECTION: Train L-10 directly to station join to Hostel every 30 minutes MAXIMUM AGE 30 YEARS. NO CHILDREN. FIRST OFFICIAL HOSTEL OF TOURIST OFFICE AND GOVERNMENT LIST. NOT ALL HOSTEL ARE OFFICIAL IN BARCELONA AND THEY DON'T COVER YOUR MONEY SO CHECK THE LIST IN TOURIST OFFICE, AND NO PROBLEM. NO DRINKING ALCOHOL IN HOSTEL. NO REFUND MONEY.